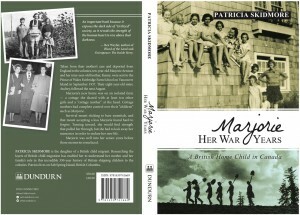 Book: Marjorie: Her War Years. A British Home Child in Canada. “Marjorie: Her War Years. A British Home Child in Canada” can now be pre-ordered at Amazon.ca and Chapters.ca. As a child, Marjorie Arnison was removed from her mother’s care and deported to the colonies. In September 1937, ten-year-old Marjorie and her nine-year-old brother Kenny were sent to the Prince of Wales Fairbridge Farm School near Cowichan Station on Vancouver Island B.C., Canada. Their eight-year-old sister Audrey (aka Bunny) followed in August 1938. Marjorie was always at ‘war’ with being removed from her family, her community and her country. Marjorie was well into her senior years before she learned that it was to her mother’s eternal distress that she lost three of her children to Canada. There was a strange comfort for Marjorie in finding out that her mother’s distress matched her own. This is a worthy sequel to Marjorie, Too Afraid to Cry, which told a painful but critically important story of lives turned upside down by the then UK Government’s policy of sending children overseas and away from their families for ever. Dr. Margaret Humphreys CBE, OAM, Child Migrants Trust, Nottingham, England. Marjorie: Her War Years is the sequel to the stunning Marjorie: Too Afraid to Cry, that chronicled the experience of British children forcibly taken from poor families and used as cheap labour and “white stock” for the British colonial empire. In 1937, at the age of 10, Marjorie Arnison found herself motherless and alone at the Prince of Wales Fairbridge Farm School, near Victoria, British Columbia, an environment of humiliation and abuse. Marjorie Her War Years follows day-to-day life at the school, how the girls banded together to soothe each other from the constant verbal abuse and to avoid the ubiquitous pedophiles. This is an important book because it exposes the dark side of “civilized” society, as it reveals the strength of the human heart to rise above that darkness. Stated in a 1944 Report by Isobel Harvey, Superintendent of Child Welfare, on the Prince of Wales Fairbridge Farm School. The visit was prompted when a cottage mother reported allegations of homosexual behaviour in her cottage. A number of pedophiles working at the farm school also came to light. The children at the Prince of Wales Fairbridge Farm School had little protection and no one to turn to. See https://www.iicsa.org.uk/key-documents/4265/view/Child%20Migration%20Programmes%20Investigation%20Report%20March%202018.pdf for the March 1, 2018 Independent Inquiry: Child Sexual Abuse. Child Migration Programmes, Investigation Report.